Recently, I saw a few pond manicures online, so I thought I'd give the pond manicure a try! For those who need an explanation, a pond manicure basically involves layers of a sheer polish, with designs (dots, flowers, or whatever you want) in between the layers. I'm not sure exactly how the pond manicure got its name, but to me, it's an apt name because the layering of sheer polish gives the designs on your nails the impression of being submerged in a pond. Kinda like they're underwater and you're viewing them from above the water. My first ever attempt at a Pond Manicure! 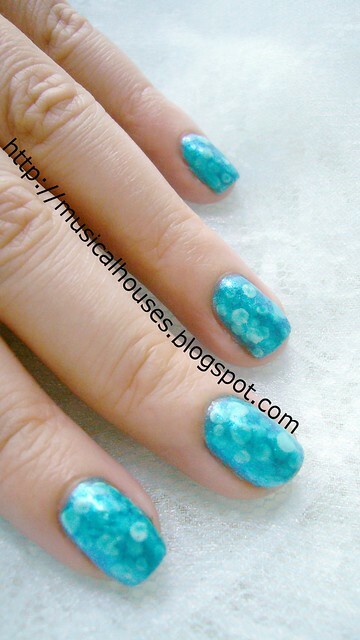 For my first ever pond manicure, I decided to use Nicole by OPI Somebody Teal Love. OMG yes I have a Justin Bieber polish, and I bought it from TJMaxx when I was in California for a holiday! I bought it because it was cheap, but after I bought it, I didn't know what to do with it because it was so annoyingly sheer. The level of pigment in the polish was quite non-existent, kinda like Justin Bieber's musical talent, I guess. (Well, I guess since I'm above two decades old, I'm just too old and creaky to appreciate the wondrousness that is his singing.) But aging teen popstar jokes aside, this polish sat unused for a long, long time, because I couldn't bring myself to apply the 4-5 coats that was necessary for full opacity. 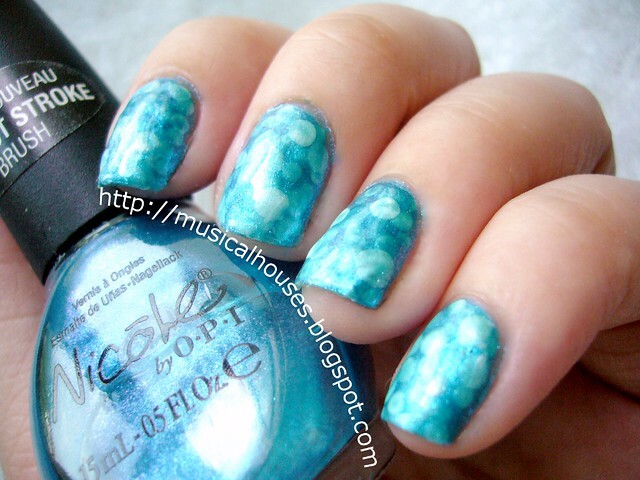 Using Nicole by OPI Somebody Teal Love (ugh, really bad name) as the "pond" colour. But then, the pond manicure came along, and suddenly this useless bottle of Somebody Teal Love seemed so much more relevant to my life. It was sheer enough to be used as a pond manicure colour! I also decided to start slow and choose simple white dots instead of any fancy multicoloured flowers. For the white dots, I used my trusty old Wet n Wild White, which I keep buying because it's cheap and awesome. I think I'm on my second or third bottle now. I think for this look to work best, a contrasting colour design is better. So light coloured bases with dark designs, and vice versa. All you need for this look is an annoyingly sheer polish, and a not-sheer polish of a contrasting colour. Actually doing a pond manicure is fairly easy, if you're not doing fancy stuff. For me, I just painted on a coat of Somebody Teal Love, added some white dots with my dotting tool (still using these ones I got from Born Pretty Store eons ago in 2011), and let it dry for a bit. And then I put on another coat of Somebody Teal Love, and more dots. If the dots overlapped, I was cool with it too. And I repeated this maybe four times, before ending off with two costs of Somebody Teal Love. Pond manicure in its full glory. Despite my not-that-great dotting skills! As you can probably tell if you scrutinized my mani properly, the dots I made were rather uneven and of different sizes. Obviously I'm still a failure with a dotting tool. Nevertheless, I felt that overall, it looked pretty good, and certainly you can see the designs from far as well. Trying out a more arty-looking hand pose. I can't decide if I like it or not! All said and done, this is pretty easy to do, just perhaps a little more time-consuming, because of all the layers of polish. I really liked the net effect - it really does kinda look a pond? Or speckled, like easter eggs. I think a similar design with dots using pastel colours would look great for Easter. Whatever it looks like, I've officially decided that I like this! This looks really good! I actually think the irregularity of your dots make it look more authentic. It's not like in a real pond all the bubbles would be perfectly symmetrical either. China Glaze Swing Baby: Glamorous Gold Nails!